We know that all sales organizations have a Qualification and Discovery process. Some are more formal than others and some follow the process better than others. The question isn’t whether you have a formal process, but rather if it is followed. Just as we’ve programmed SDA to configure the solution to be sold and generate outputs, we’ve also automated the process of qualification and discovery. Available to all SDA subscribers, two specialized modules – Qualification and Detailed Discovery – can be added to any SDA setup at no additional cost to the monthly subscription. Once questions are answered in SDA, they can be programmed to automatically create an Executive Summary within the proposal along with driving portions of the statement of work and other outputs. By automating the first stage of the sales process, you no longer need to rely on your memory or informal notes that somehow no longer make sense when you return to the office to start on the configuration and proposal. It can also include labor requirements such as union labor usage or if a cut-over must be completed after-hours and therefore priced for that. 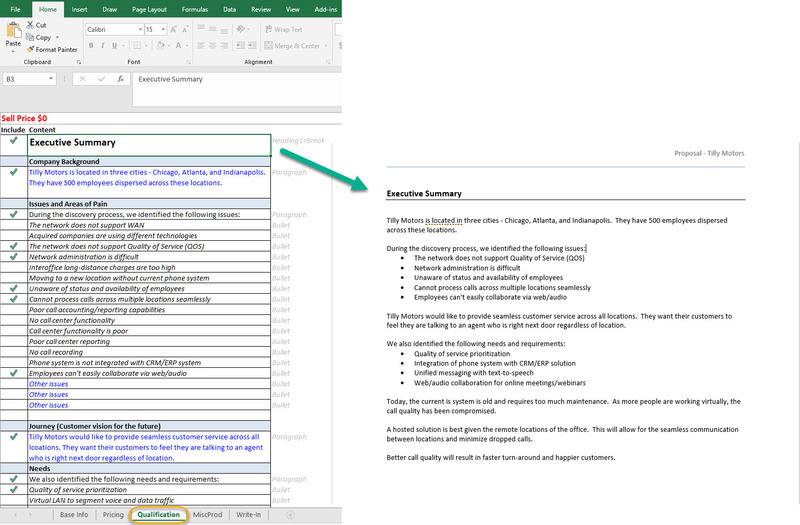 Using Excel rules, additional questions can require answers based on previous selections. The information from the Detailed Discovery will then flow into letters or memos, an appendix to the proposal, and/or the statement of work. Add the Qualification and Detailed Discovery modules to SDA. Contact CorsPro Client Services to get set up. An informal qualification and discovery process that includes only a handful of questions or set of forms no one completes can have serious impact down the road. Hard to follow and mundane processes in the beginning of the sales process aren’t just difficult for the sales organization, it reduces customer satisfaction in the sales journey. More efficient processes that include automation and enforcement mean that Qualification and Discovery are consistently able to impress the customer. SalesDoc Architect’s automation takes the information gathered and brings a heightened level of detail to the SOW and executive summary level, which demonstrates a competence and attention to detail on behalf of the salesperson to the customer. Through these improvements, sales avoid scope creep that results from erroneous assumptions about the work to be provided that can eat into margins. Ensures you’re pursuing the right opportunity by asking qualifying questions. Allows you to configure the correct solution. Auto-configures the products and services, and language around what is included and excluded for use in the SOWs based on the answers in the Qualification and Discovery process to avoid scope creep. 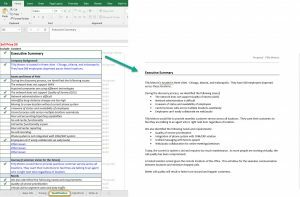 Leverages information like descriptions of pain points and areas of need for other outputs like discovery memos, proposals, and executive summaries to display that you have listened and understood the prospect’s needs and concerns. The best part? Simply contact the CorsPro Client Support team to have the Qualification and Detailed Discovery modules added to your SDA setup. They’ll work with you to set up customized Qualification and Detailed Discovery tabs that will flow into the rest of your SalesDoc Architect implementation – at no additional monthly cost to you! Contact Client Support to get set up with the Qualification and Detailed Discovery modules.